This is the house that once stood where the Broadway-Valentine Shopping Center is today. The limestone wall of the property [facing Pennsylvania] still has the name Elmhurst by the stairs going down to the back of the shopping center. Mr. Joseph T. Bird was part of the Emery, Bird, Thayer Company. When Joseph Bird of Emery [Thayer of Dry Goods] was alive, his wife Annie Rodenbaugh Bird led the "congenitally genteel life of a prominent merchant's wife." But when her husband died in 1918, he left her a controlling interest in the business. She had always followed her husband's business closely so she had little trouble being elected President of EBT [named EBT in 1894] in 1920. She is believed to be the first KC woman to hold such a position. ​When she died, she left it in her will that Elmhurst [her home] would be razed because she didn't want anyone else living in her home. Mrs. Bird and her daughter Josephine Hall continued Mr. Bird's philanthropic tradition by contributing to many charities including Children's Mercy Hospital. Credit goes to Jean Schembri who posted this on Facebook on September 18, 2014 in the "Kansas City Memories ... Vintage Photos, Places and Things Remembered" group. ​A wrecking crew this week will start razing the stately home, Elmhurst, of the late Mrs. Annie Byrd. 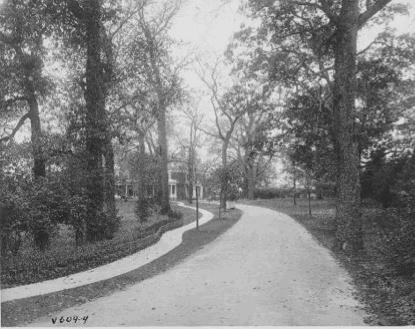 The house stands at the west end of a five-acre tract extending from Broadway, along Valentine Road to Pennsylvania Avenue. The house, containing 18 rooms, was erected in 1898 by the late John Perry as a surprise for his wife and children, then in Europe. Elmhurst, the Southern colonial stone mansion on a five-acre tract at Broadway and Valentine. Long the home of Mrs. Annie Rodenbauugh Bird, widow of Joseph T. Bird, Kansas City merchant prince, will be razed this week. Since the death of Mrs. Bird January 28, the home has been occupied only by a caretaker. Mrs. Bird's only daughter, Mrs. Porter T. Hall and Mr. Hall live in the Mission Hills District, so it was deemed advisable to raze the Bird home and make the tract of five acres available for business and other development. The 18-room mansion was built in 1898 by the late John Perry, pioneer Kansas City business man and one of the founders of the Keith & Perry Coal Company, later the Central Coal & Coke company, and builders of the Keith and Perry building at Ninth and Walnut Streets. Mr. Perry planned the house as a surprise for his wife and four children, then in Europe on a visit. The wife and children never saw the home prepared for them. On the journey back to the United States the French ship, La Burgoyne, on which they were passangers, sank near Cape Sable off the coast of Nova Scotia, after a collision with the Cromartyshire. There were 560 lives lost in the disaster. ​Razing starts Wednesday – Such was Mrs. Joseph T. Bird's commitment to Elmhurst and its ample grounds at 3600 Broadway that she preserved the house for a lifetime, even though a hotel towered above her lilacs and a theater and busy shops became neighbors. Now instead of a single house the five acres is expected to house several families.